More than 100 years ago, the Bethany plantation, now part of the Watkins Mill State Historic Site, was a bustling center of activity for rural communities in Clay County, Missouri. In its heyday the plantation, owned by Waltus Watkins, included an elegant home and a three-story mill where wool was spun into yarn, woven into cloth and blankets, and sold in bolts at the small general store located on the first floor. A church and octagonal school building were built adjacent to the plantation, which also had a brick kiln, sawmill, gristmill, and blacksmith shop. The story of the plantation and of Watkins Mill begins in 1830 when Watkins, a native of Kentucky, joined many other young men of the period in a move westward. Watkins settled in Liberty, Missouri, and, after an unsuccessful attempt at cotton milling, he purchased 80 acres of land in the northwest corner of Clay County and turned his interests to agriculture. Watkins, new occupation proved more successful than his milling venture, and his land holdings ultimately encompassed several thousand acres.Watkins, however, never gave up the idea of textile production and in 1861, at the age of 55, he launched the major venture of his life — the Watkins Woolen Mill. Like the plantation home he built earlier, the mill was constructed of brick, handmade at the site, and was supported by timbers cut from his land. The mill contained more than 50 machines, which had been shipped by steamboat from the East via the Ohio, Mississippi, and the Missouri rivers. The boiler, which measured 30 feet in length, and the steam engine to power it were shipped from St. Louis to the river landing at Missouri City, and, like the other machines, were hauled some 20 miles to the mill site by teams of oxen.By May of 1861, Watkins Mill was ready for operation. During the Civil War, Watkins did a steady business selling blankets and cloth. After the war he turned to trade, and by the late 1860s the factory was running at nearly full production, consuming some forty to sixty thousand pounds of woolen fleece annually.The mill continued to prosper through the 1870s. Although it remained in business off and on for years, it never again reached its former level of production. Finally, in the late 1880’s, the increased competition and availability of ready-made clothing forced the mill out of business. In the 1950s, the mill was acquired by the Watkins Mill Association and opened to the public. 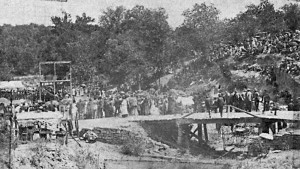 In 1963, voters of Clay County passed a bond issue to purchase the mill and surrounding acreage, then turned it over to the state of Missouri. In 1966, Watkins Woolen Mill, the only fully equipped 19th-century textile mill left in the country, was designated as a National Historic Landmark. Today, the state historic site, which includes the mill, plantation house, school, church, and outbuildings, and the adjoining state park are administered by the Missouri Department of Natural Resources’ Division of Parks and Historic Preservation. What to See… Watkins Mill is the country’s only 19th-century textile factory with its original machinery intact. The mill is open to visitors all year, with the exception of Christmas, New Year’s Day, Easter, and Thanksgiving. Tours are given Monday through Saturday from 10 a.m. to 4 p.m., on winter Sundays from 11 a.m. to 4 p.m., and summer Sunday’s from 12 noon to 6 p.m. Special group tours may be arranged by contacting the historic site office. A nominal fee is charged. Watkins Home… Built in 1850, portions of the old Watkins home are open to the public. Many of the original furnishings remain. An unusual walnut staircase leading to the second floor enhances this home, built in the Greek Revival style of architecture.